This half of California offers more must-see destinations most other countries could even dream of. Focusing on sophisticated Northern California, this road trip includes the culture of San Francisco, the stunning scenery of Napa Valley, Lake Tahoe and Yosemite along with a famous drive on the Big Sur. Once you’ve settled into your first hotel, why not step out on the streets of San Francisco and enjoy a meal at one of the city's amazing restaurants. Alcatraz, Lombard Street, Coit Tower, Fisherman's Wharf and Chinatown are just some of the incredible must-see destinations available to you today. Your personalised Itinerary Pack will help you prioritise all of San Francisco’s visitor attractions, whilst giving you all the information you’ll require to enjoy them. Once California’s capital and a major whaling town, today Monterey is best known for the world-class Monterey Bay Aquarium that presides on Cannery Row, which focuses instead on marine education and preservation. Want to experience the bay area first hand? Take a whale watching trip during spring or autumn. Connecting Monterey and Carmel-by-the-Sea is the 17-Mile Drive, this scenic toll road takes you on a little tour past rugged beaches, millionaire homes and wind-blown cypress trees. Seals bask in the sun on offshore rocks and sea otters bob up and down in the waves. The legendary Pebble Beach golf course can be found here also. At the other end of the drive is lovely Carmel-by-the-Sea with its world-class beaches, charming homes and classy restaurants. The classic All-American drive down California’s Highway 1 becomes even more dramatic when it passes through the 90 miles of coastal road that is the Big Sur. Twisting roads curve around the steep cliff faces, occasionally passing gorgeous State Parks and spectacular vista lay-bys that look out over the vast Pacific Ocean. At the end of Big Sur lies Hearst Castle, this mansion is perched on “The Enchanted Hill” and overlooks the Pacific ocean in the distance. This is an extraordinary home that hosted the worlds most famous and wealthy, today it offers visitors the chance to see fine antiques and art from around the world in an over the top setting. In total Yosemite National Park is over 1180 sqm of nature at its best. The most visited area of the park is Valley Floor. Vast rock faces, crystal clear waters, staggering views and stunning waterfalls combine to make Yosemite a real national treasure. Spend your second day exploring Yosemite National Park. Outside of the main valley area, you can enjoy Tuolumne Meadows and Glacier Point from May to October and The Mariposa Grove offers gigantic Redwoods to marvel at and is near the south entrance. Gaze up in wonder at this natural wonders. In the summer months, you can opt to lie on a beach, gamble in the Nevada casino’s or cruise the entire 71-mile shoreline. From November to April you’ll be able to rent some skis and hit the slopes at one of the 7 world class resorts that surround the lake. Lassen Volcanic National Park is home to smoking fumaroles, meadows freckled with wildflowers, clear mountain lakes, and numerous volcanoes. Jagged peaks tell the story of its eruptive past while hot water continues to mould the land. This relatively un-known National Park offers opportunities to discover the wonder and mysteries of volcanoes. 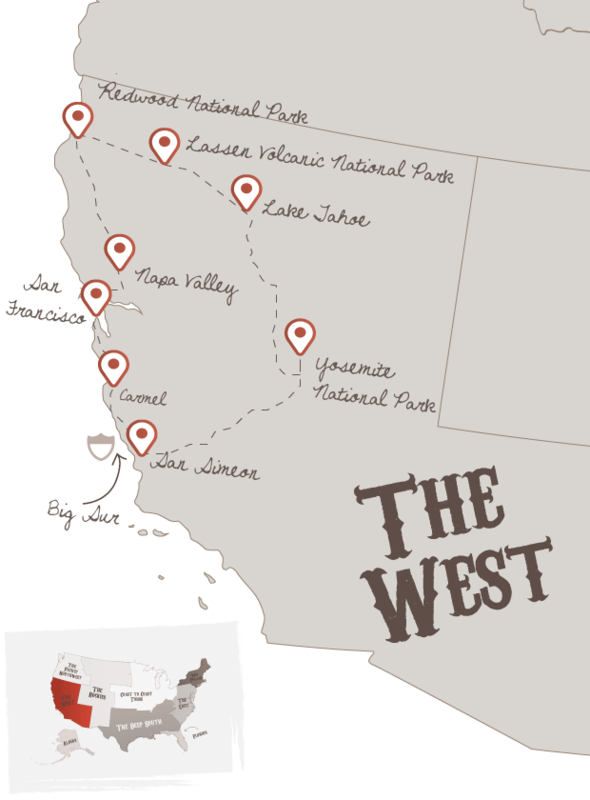 Cruise along scenic Highway 299 to the majestic Redwood National Park and some of the State Parks that surround it. Redwoods were once common throughout North America but sadly are now only commonly found in Oregon and California. For the ultimate Sequoias experience head to the Redwood National Park in northern coastal California. These are true giants at up to 100m high and 11m in diameter. Once you've stood amongst these trees, the stresses of work and home life just melt away. Anyone for a glass of wine? Scenic Highway 1 will take you south to America’s premier wine region - Napa and Sonoma Valley. The two neighbouring valleys of Napa and Sonoma offer stunning scenery made up of perfectly manicured vineyards stretching across rolling hills which can be enjoyed by car or even by an early morning hot air balloon ride. This is a foodies’ heaven, with places like Thomas Keller’s Bouchon restaurant regularly picking up awards. Tomorrow, head back towards San Francisco for your overnight flight back to the UK. Don't forget to check out this road trip's Itinerary tab to see more amazing pictures from our 'Northern California' tour. You'll also be able to read a little bit about what you'll be getting up to on each day of this incredible road trip adventure.